Goodgod Trivia’s most popular, longest-running pop culture trivia night kicks off July with an all-Season 6 session! Spend an evening with the Stonecutters, with Itchy & Scratchy Land, The Simpsons’ Australian visit, and so many other classic episodes. 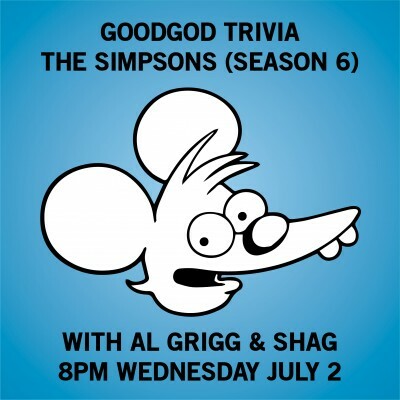 As always, Al Grigg & Shag will be there to test your knowledge. Will you be the Chosen One? Free and first in, best dressed. First questions from 8pm. It’s also the second-last week of The Dip so get down for some of our famous eats!